The best camera is not the one you have with you. It's the one you want to have with you. I finally had an opportunity to get down to a store and put my hands on a few mirrorless camera bodies. The selection was limited and a few of the options I wanted to try were unavailable. If anything, I learned that Futureshop and Best Buy are not photography stores. Regardless, my wife and I tried a Sony A7 and spun a few wheels before determining it was too big for our liking. We moved on to a Sony A5000 only to realize it was below the quality we were looking for. We even looked at a few DSLRs — that was a waste of time. We stumbled into the Olympus section before too long and put our hands on an EM-1, an EM-5 and an EPL-5. I put the EM-1 and EM-5 up to my eye and was pleasantly surprised with their electronic viewfinders. The EPL-5's size was impressively tiny. "But these are all Micro Four Thirds cameras," I told my wife. "I've read that we're supposed to stay away from these." We meandered through the TV section and the appliance section. My wife fantasized for a few seconds about those minimal Dyson Tower Fans. We probably had a conversation or two. Why hadn't I stumbled across the EM-5 during my research? Why did the EM-5 stand out? Why is Micro Four Thirds not adviseable for someone like me? Could Micro Four Thirds actually be pretty good? We ended up going back to the Olympus section to ponder the EM-5. It's the perfect size for both of us. It has enough power-features to keep me learning and on my toes and it is simple enough for my wife to pick up and fire away. It has a big, bright screen with a big, bright viewfinder. And it feels super solid. I became giddy. This is the kind of camera that I want to use. It's the kind of camera my wife wants to use. It's the kind of camera we want to buy. It's the kind of camera that will make both of us happy. 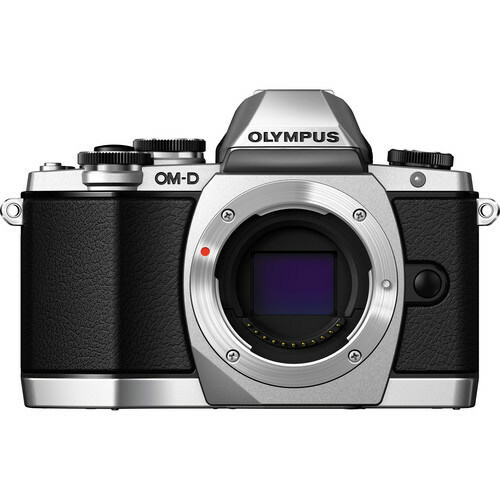 So, how incredibly fortunate were we to learn that Olympus just released a new OM-D mirrorless camera that virtually replicates the EM-5? Sure, the EM-10 doesn't come with weather sealing or the extra image stabilization features. But it's the same camera that drew our gaze a few days ago. And it even has "the wifis". It may be assumptive to immediately accept the EM-10 after playing with only the EM-5, but if the tiny differences between the two are enough for us to fall out of live with the EM-10, then we can grab our first love. I was given some incredibleadvice after posting my initial research last week. Conor and Ben both pointed me to Fujifilm's awesome mirrorless cameras. The results speak for themselves: Fuji's lenses are razor sharp and their camera bodies have (potentially) the best sensors in mirrorless bodies today. In complete contrast, Micro Four Thirds cameras don't deliver the same image quality and they are certainly held back technically by their 2x cropped sensors. I don't think there's any denying that Micro Four Thirds cameras are not capable of doing the best portraiture. We don't care though. We just want to take some photos and we want those photos to be pretty nice. We aren't professionals. We won't make photobooks for anyone but ourselves. So in that sense, any Micro Four Thirds body probably fits us better than other systems. Micro Four Thirds lenses are cheaper and are more abundant than other mirrorless lenses. The camera bodies are smaller and are very popular. If wielded properly, any Micro Four Thirds system can take some pretty sweet photos. And Olympus' offerings truly blew us away. Pick a camera and a lens that you love and use it. Make a lot of photos. Give the photography game a few weeks, months, or years, and then you can start playing with extra bodies, fast lenses, and professional lighting. The Olympus EM-10 appears to be meant for us. It's the camera we want. At the price we want. And we fell in love with the OM-D line the moment we picked one of them up. Contrary to popular belief, the best camera isn't the one you have with you or the camera with the best specifications. It's the camera you know you want to use — the camera you know you want to buy. Before someone jabs the "best camera mantra" down your throat, remember that photography needs to be enjoyable. And the camera that makes it enjoyable is the best camera there is.